At breakfast Charlie made friend with the krumping boy from last night and they chased the cats around finding the whole game very funny and exciting. 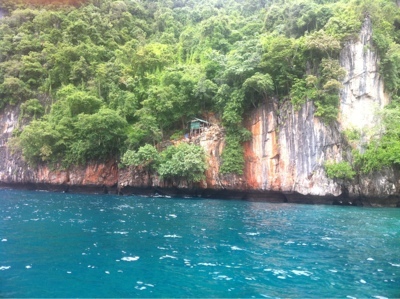 After eating we arranged for a 3 hour personal long boat tour of Phi Phi Ley island. 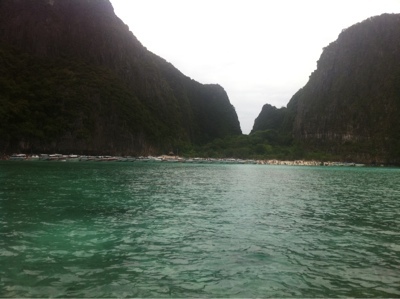 This is the little sister island to Phi Phi Don and is absolutely beautiful. 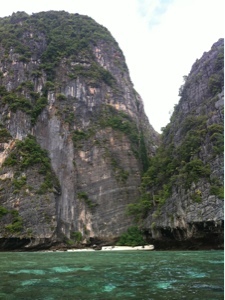 With sheer rock cliff faces rising out of the ocean it is like a scene from a movie. We first passed Viking Cave where there seems to be some kind of camp with crazy bamboo scaffolding built onto the cliff face. I was told that they collect the birds nests from there and sell them at a very high price to the Japanese who use them to make soup. The birds make the nests with their saliva which it is believed has special qualities. 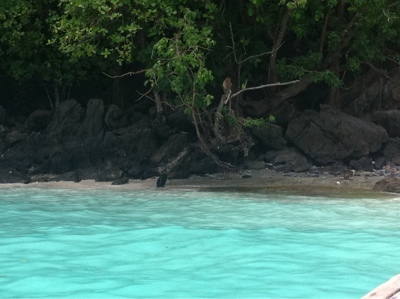 The first stop was the blue lagoon where we snorkeled in a secluded inlet with crystal blue water. It was just so beautiful we had to pinch ourselves. 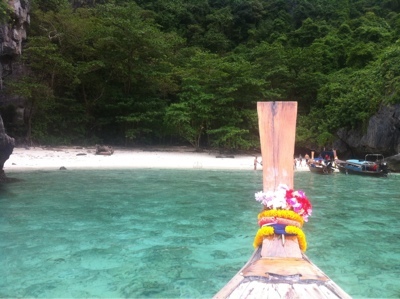 To our delight Charlie had no problem swimming off the long boat with her floaties. I took a few photos but unfortunately it was very bright and I think I had some water drops on the lense so the photos are a bit blurry. We could gave stayed all day but had more beaches to see so we got back in the boat to go to another secluded beach where we went snorkeling again and played on the beach with Charlie. 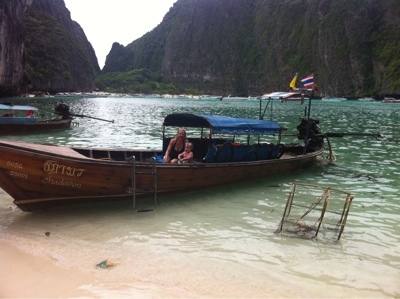 Both these stops were quite secluded with only a few boats at each. 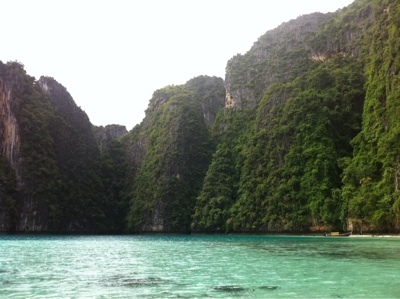 The next stop was Maya Bay which is much more popular as it is where the movie 'The Beach' was filmed. There must have been 50 or more speedboats moored there and you could hardly see the beach. It wasn't our thing and we told the driver not to bother, he pointed out a smaller side beach with only one other long boat and we agreed that would be better. This time Charlie donned some goggles we bought her in Bangkok and didn't mind me pulling her underwater to look at the fish. There were lot of beautiful reef fish of many colours, some of them quite large. 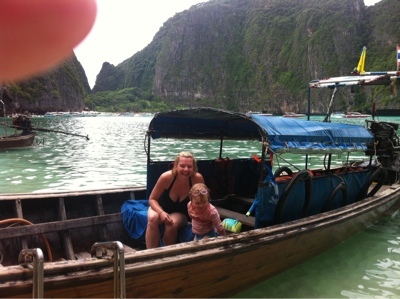 After about 20 minutes we got back in the boat at headed to Monkey Bay which is actually on Phi Phi Don. 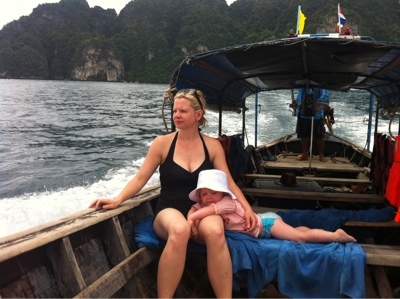 Charlie was pretty exhausted by this stage but had found a good strategy of lying down in the boat between stops and comforting herself with sandwiches that Tina had wisely packed. 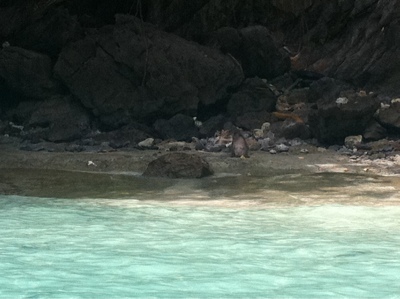 She quickly rose to attention when she heard us mention monkeys as we arrived at Monkey Bay. You can't get off the boat as the monkeys apparently bite but they put on a show as the staff from one of the speedboats threw them fruit. 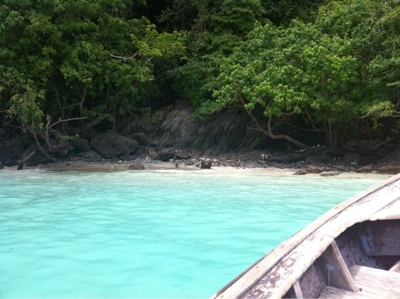 After a few minutes of monkey watching we waved them goodbye and returned to the resort for lunch. 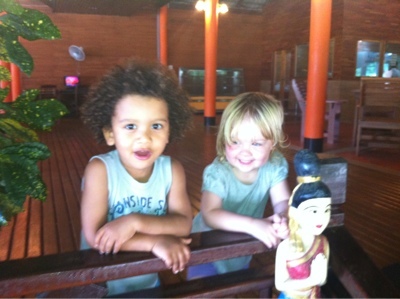 Charlie was very happy to see the resort are started cheering and punching the air with delight! It was another absolutely wonderful day that we will both remember for a long time.